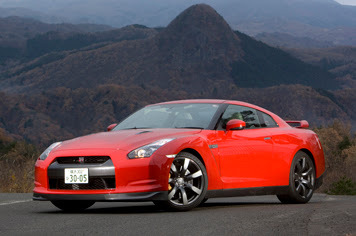 "Heading the list, of course, is the Nissan GT-R, the long-awaited follow-up to Nissan’s giant-killing Skyline. Unlike the Skyline, however, which was a normal production saloon converted to greatness with tweaks and turbos, the new car was built from the ground up as a demonstration that Japanese attention to detail is capable of crushing European passion and American power. Some testers are even mentioning the £60,000 GT-R in the same breath as the Bugatti Veyron. They say that you can enter a corner at a suicidal speed and as you feel the tyres give up their struggle to hang on, you accelerate. They talk about how you can feel the computers working out a solution, and how the grip is restored, harnessed and exploited in a way that leaves you wide-eyed with startlement." "It’s not a pretty car and that’s half the appeal. You have the sense that everything on it, from its gormless bottom lip to its angular stealth bomber roofline, was designed to make it that little bit faster. And that’s before you get to the plasma-coated cylinder bores. Or the computer-controlled four-wheel-drive system. Or the twin turbocharged 3.8 litre V6. This is a car that uses PlayStation electronics to tackle the laws of physics. And from what I’m hearing the results are almost beyond comprehension. They’re even claiming it lapped the Nürburgring in 7min 38sec. That’s faster than a Porsche 911 Turbo. Sadly, demand for the GT-R will be so high that official imports won’t start in Britain for another year, by which time they’re saying the even more incredible V-spec model we’ll get will be £65,000."